Hi and welcome back to our Ask the Home Flooring Pros segment where we answer your flooring questions. This week we tackle the question is bamboo flooring waterproof? It’s pretty common knowledge that hardwood flooring and water don’t really mix but as bamboo isn’t a hardwood does it have different properties that make it more suitable for areas where water maybe a factor? The bottom line is that properly sealed bamboo flooring is water resistant, but it is not waterproof. In other words, it’s not sheet vinyl or ceramic tile that water can sit on for hours without causing damage. In time, water puddling on bamboo will seep into the gaps between the planks, absorb into the organic material and cause it to swell. The result will be stained flooring that is coming apart at the seams. Bamboo flooring doesn’t swell and shrink as much as solid hardwood flooring does with normal humidity changes. That’s why some argue that it’s OK for the kitchen, laundry and rooms below grade. The reason we discourage its use in those areas is that they are susceptible to water damage – from water supply lines, sink and dishwasher drains, appliances overflowing and flooding in the basement. With other suitable waterproof flooring options available, taking the risk isn’t necessary. Bamboo flooring gets an even stronger “no” from us for use in bathrooms where shower overspray is common and the foyer where water running off shoes, an umbrella or door mat will stain or swell the bamboo. On the other hand, bamboo is a lovely flooring choice for living spaces including the living room, den, home office and bedrooms. It is harder than most domestic hardwood flooring, so makes a great choice for high-traffic areas, activity rooms and home gyms too. Reseal bamboo flooring every two years or per the manufacturer’s recommendation. Clean up wet spills immediately. For general cleaning, sweep the floor and use a damp cloth for more stubborn dirt; Dry the floor after using water to clean it. Never use a steam cleaner on bamboo flooring. For more on bamboo cleaning and care click here. 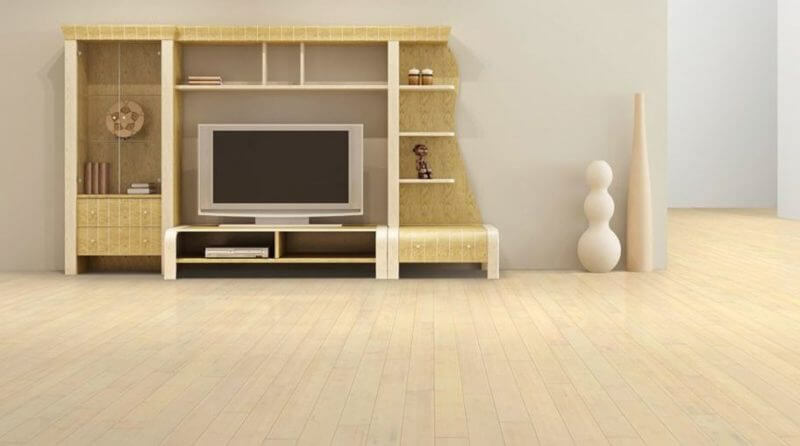 So to summarize, quality, finished bamboo flooring is water resistant and can be used in areas like the kitchen, but there’s no such thing as waterproof bamboo flooring and you should avoid using it in an area where water or high humidity is going to be a continual threat. If you’re flooring really does need to be waterproof rather than water resistant take a look at our post on waterproof basement flooring options.